This story was originally published by Mother Jones and is reproduced here as part of Climate Desk. President Donald Trump will issue his long-promised executive order rolling back federal government efforts to fight climate change Tuesday. 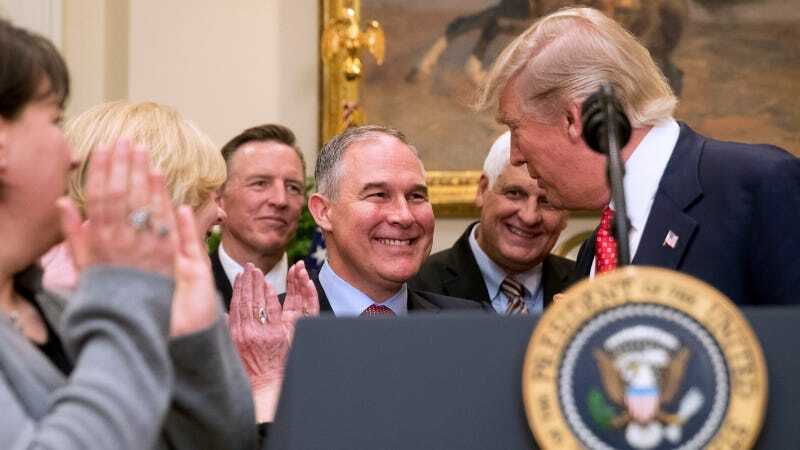 The wide-ranging order, which will be accompanied by other environmental directives, targets Obama-era policies across the government, including in the Environmental Protection Agency, the Department of Interior, and the Department of Defense. It directs the EPA to revisit the Clean Power Plan, which limits carbon pollution from power plants and was considered the center-piece of former President Barack Obama's climate policy. Additionally, Trump is asking the Justice Department to stop defending the plan in court. The president will instruct agencies to rescind a moratorium on coal leasing on public lands; rewrite limits on methane emissions from the oil and gas industry; and ignore the EPA's current calculation on the costs of carbon pollution. There are also broad directives reversing an Obama initiative requiring that federal departments consider climate mitigation strategy and the national security risks of global warming. One of Trump's more notable "Day One" promises is missing, however: The United States will remain in the landmark Paris climate accord for the time being—despite Trump's pledge to "cancel" it. Still, environmentalists are furious. "This is not just dangerous; it's embarrassing to us and our businesses on a global scale to be dismissing opportunities for new technologies, economic growth, and US leadership," Obama EPA Administrator Gina McCarthy said in a statement. Sen. Edward Markey (D-Mass.) called Trump's actions "a declaration of war on American leadership on climate change and our clean energy future" in his own statement. Indeed, Tuesday's actions are just the start of a long fight over the federal government's role in confronting climate change. Undoing the regulations already on the books, from the Clean Power Plan to the methane rule, could take several years. And Trump will face fierce resistance throughout the protracted fight. Green groups are already threatening legal action. On a press call Monday night, a senior White House official also stuck to that script. That is, until reporters asked him whether administration staffers who worked on the order accepted the science behind global warming and sea level rise—and the research showing that climate change makes extreme weather worse. "I would like to see" that research, said the official, who spoke on background to reporters. "Send it to me." Asked whether the president and his staff all believe in manmade climate change, the official stumbled, "Um…again I think it's not a controversial statement. The key question is the extent over what frame of time." Asked whether the official personally believed climate change is manmade, he said, "Yeah, sure I do. That doesn't say much does it?" It actually says a lot. Trump and Pruitt have both at times dismissed climate science—Trump infamously called it a Chinese hoax. Environmental lawyers think these pronouncements could strengthen their lawsuits. "It is possible that statements of that sort will come back to haunt them," Richard Revesz, a New York University environmental law professor, said. "It would suggest they prejudge the science before consulting with scientists. There is a pretty high burden for departing from an existing rule." The Clean Power Plan was the Obama EPA's strategy for reducing carbon pollution from existing power plants 32% by 2030. Under this rule, states would have to submit plans to achieve customized emissions targets using a mix of renewables, natural gas, and energy efficiency. The Supreme Court put the rule on hold last year as attempts to block it wind their way through the court system, so the EPA's work on the program has ground to a halt. Trump's order directs the EPA to revise the plan and review what it thinks is required under the Clean Air Act, which forms the basis for the power plant regulations. The moves will require an extensive public notice and comment period to justify any changes, and the administration has yet to make a timetable public. Trump is instructing the EPA to revise the rule (and weaken it substantially)—rather than rescind it entirely—presumably because the Supreme Court told the agency in 2007 it must regulate carbon pollution if it finds carbon to be a threat to human health. The agency issued this so-called "endangerment finding" in 2009, and it was upheld in a 2012 appeals court case. As long as the EPA's finding that climate change poses a health danger remains in effect, the EPA is legally required to issue regulations based on the "best available science." While revoking the endangerment finding has long been a goal of some on the right, it would be a difficult feat that would likely involve convincing the courts that climate change is, as Trump contends, a hoax. Adding more complication still, the DC federal court of appeals has yet to issue its opinion on the legality of the Clean Power Plan, after hearing the case on an expedited schedule last fall. As expected, Trump is now asking the Department of Justice to withdraw its defense of the plan. Of course, translating the impacts of carbon emissions and climate change into an economic "cost" that can be measured in dollars is a complicated undertaking. Obama's EPA ultimately worked out a formula for tabulating these costs and used it as a basis for its climate regulations. Trump's order directs the EPA to ignore this calculation. In January 2016, Obama ordered a moratorium on new coal leases on public lands until Interior could update its badly outdated leasing program. Trump is now directing the department to reverse that moratorium. Unlike the Clean Power Plan, which was a formal rule that can only be undone through a drawn-out process, Interior can act on this directive immediately. When that happens, environmental groups are ready to fight back. Earthjustice expects this to be the first in a long series of legal battles over Tuesday's order. The group says it plans to file a lawsuit within hours of the agency's action. "We expect to challenge any action that allows coal leasing to resume before [an] environmental review is completed that evaluates whether the federal coal leasing program should be reformed (or scrapped altogether) in light of its significant climate impacts and failure to generate a fair return for US taxpayers," Earthjustice attorney Jenny Harbine said. The Obama administration finalized a series of regulations toward the end of his presidency limiting methane emissions. Among them was an Interior rule limiting excessive flaring and venting from oil and gas operations on public lands. Like the Clean Power Plan, this change will have to go through a formal rulemaking process in order for Trump to undo it. Trump will also rescind Obama's broad strategy, released in 2014, for reducing methane emissions. Rebecca Leber is a reporter in Mother Jones' DC bureau covering climate, environment, and energy politics. Previously, she reported for The New Republic, Grist, and ThinkProgress.